::: Off the Radar :::: Good Grief! Last night, I turned on the TV to watch Dexter (dvr) and ABC was tuned in. A Charlie Brown Thanksgiving had just started. Charlie and Lucy were discussing the traditional Thanksgiving football game and poor Chuck was falling for it hook, line and sinker. I couldn't resist. Dexter wasn't going anywhere. It had been years since I had seen any Charlie Brown special. The stories were simple. The dialog short. No fancy CGI... and well an AMAZING soundtrack by Vince Guaraldi. And they have stood the test of time. 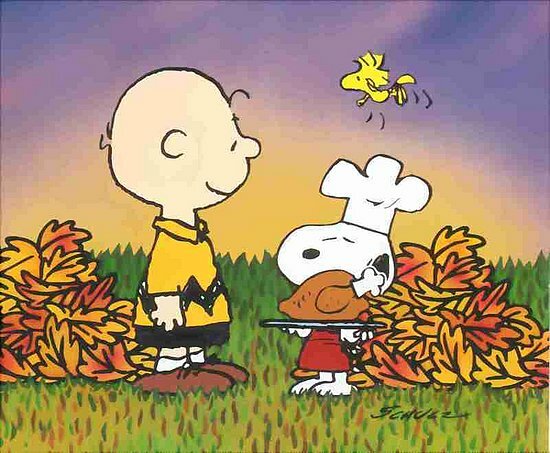 The cartoons themselves have become an Thanksgiving (and Christmas) tradition. I usually play the Vince Guaraldi soundtrack once every holiday season. The music is sophisticated considering the intended audience of the cartoons but not out of reach. Go figure, a kid might grow up and listen to the Vince Guaraldi soundtrack but I highly doubt listent to a Dora the Explorer song past the age of 10. Vince Guaraldi's ode to Woodstock stuck out for me last night. And yeah, I watched Dexter right after. In life it's all about balance. Here is the scene where Snoopy gets into a little altercation with a folding chair as Little Birdie plays in the background. yo chris, the links not working on this one. hope you enjoyed your day off! Fixed! And day off is over and I'm back at it... I hope it's a quiet day.